Picturesque surroundings, the ability to commune with and admire wild nature – these are just two of many reasons why it is worth to visit our all-year Holiday Centre “Łabędzi Ostrów” [Swan islet]. It is located in the village Piękna Góra, in the very heart of the Swans trail, near the popular tourist resort – Gizycko. Such location is excellent for a thorough recuperation, superb relaxation and calming down. At the same time this is a great place for sailing and yachting and communing with nature. All-year Holiday Centre “Łabędzi Ostrów” [Swan islet] offers wide range of accommodation options and gastronomic services. It also has two equipped conference rooms, wellness facilities and a colourful playground for children. There is also a yacht port with one hundred fifteen mooring slots prepared for sailors. If you are looking for a great place to spend your holiday, organize integration events, sledge rides or conferences or trainings – all those qualities are worth considering. We are available at your disposal all year round. We heartily invite you to visit our holiday centre! Our holiday complex near Giżycko is an excellent place for organizing a wedding party. Spacious and beautifully decorated wedding room with exquisite menu and luxurious accommodation options ensures a splendid setting for such a unique event. Always prepared and professional staff watches over the proper course of entire event and comfort and well-being of the Bride and Groom. We ensure this will be a night to remember! Our leisure centre provides professional conditions for organization of business meetings, trainings, conferences, etc. The facility has two rooms fully adjusted for delivering lectures, giving talks and carrying out discussion panels. The rooms have been equipped with state-of-the-art multimedia appliances. Convenient location in the Masurian Lake District near Giżycko enables to explore the beauty and attractions of this region in the spare time. Our leisure centre offer lodging in comfortably furnished hotel suites and rooms. However we especially recommend spending your holiday time in an all-year or summer cabin. This is a very appealing proposal, especially for the holidays. Buildings are made of wood and are surrounded by a pictureque forest. 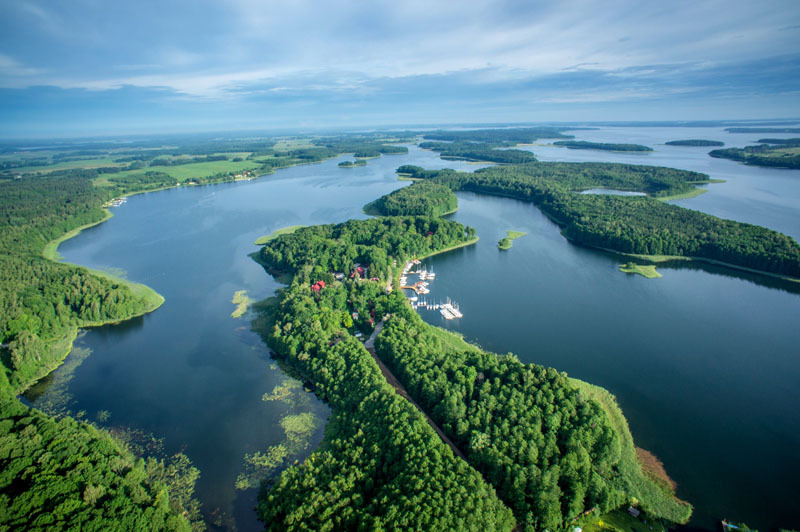 We offer you 2-person facilities for a Couple to spend a romatic weekend in the Masurian District as well as 3-, 4- and 6-person cabins for family or friends. Our restaurant is famous for its delicious meals, prepared by the chef from fresh ingredients, which ensures exquisite seasonal flavours from the fruits of the forest and lake. We especially recommed fish we smoke ourselves and meals prepared according to traditional recipies. If you want to embark on an unforgettable culinary journey through the tastes and flavours of the Masurian cuisine, you simply must visit the restaurant Łabędzi Ostrów [Swan islet] near Giżycko.